Watch this emotional Kleenex video that pays tribute to NICU nurses and all the hard work that they do. And grab the tissues (naturally), this is a tearjerker. Several years ago, I visited a friend's baby in the NICU. I was not prepared for what I saw: tiny babies hooked up to machines, fighting for their lives, mothers sitting in rocking chairs, feeding itty bitty infants through tubes, nurses monitoring the most vulnerable patients imaginable. That day, I developed a deep respect for any parent who has to endure the pain of not being able to bring their baby home, and for the caregivers who help them navigate this incredibly difficult journey. Watching a new video created by Kleenex brought me back to the day I peered through the plastic walls of my friend's son's isolette. As hard as it was to see him in there, it was even more heartbreaking to watch a new mom struggling in vain to remain optimistic, even though she had to go home alone each night. 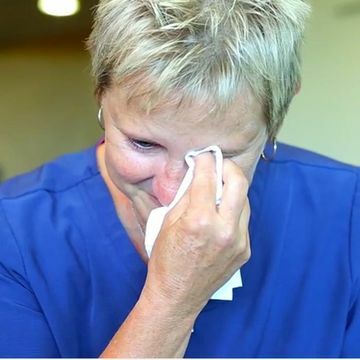 I know my friend was eternally grateful to the nurses who stepped in to care for her baby until she could return the next morning, nurses like Renee, who we meet in the video, created in honor of National Neonatal Nurses Day. "I feel like if I treat the babies like I would want someone to treat my baby when I'm not there, that's the most important thing," Renee tells us, adding that she keeps in touch with the families after they leave to see how they're progressing. It turns out those families have a little surprise for Renee. We watch as she is asked to view a video. And yes, Kleenex, we needed tissues to make it through the rest of your tribute to NICU nurses. Well played. Renee is plowing through the tissues herself as she hears messages from the parents she helped. "You are our hero," says one. Then, in walk the families featured in the clip. Kids are holding photos of themselves as premature babies as they file into the room, one after the other. Once they are all assembled they shout in unison: "Thank you Renee!" "I don't do what I do for any kind of thank you, but it's a wonderful feeling to be appreciated," Renee admits. Meanwhile, I'm sure many moms and dads whose babies required care in the NICU would love to thank their nurses. It's in that spirit this video encourages everyone to thank someone who helped them. And by the way, Kleenex, we forgive you for making us cry, but only because those kids are so adorable!